Jasmine is included in bookings of 13 and 14 people and can be rented by groups of 12 or less for £200 per week. It is never rented independently of the main house. Maximum numbers depend on the mix of adults and children and time of year. Please let us know a little bit about your party when making enquiries, including how many adults and the ages of the children, if any. * We recommend having at least one car in the group for shopping, but car-free holidays are enjoyed by guests and airport transfers can normally be arranged. * Órgiva is a 20/25 minute walk – down a goat track and then quiet back lanes. It may not be suitable for the less mobile and best walked during the cooler parts of the day in summer. Weather permitting - it's open mid-April to October. Passive solar heating and thermal cover. This relies on sunshine so the temperature cannot be guaranteed. * A bestselling book written about the area – ‘Driving Over Lemons’ by Chris Stewart – a ‘must-read’ before your stay! Almond Hill House is a lovely self-catering venue for small courses and retreats. Please get in touch for more information and prices - telling us a little bit about your course or retreat. The house has been enjoyed as a holiday house since 1994 – and was one of the first in Granada registered as a Vivienda Rural. We bought Almond Hill House in 2014 and modernised the house whilst retaining its rustic charm and improving its accessibility. We live in a neighboring property with our own private gardens, terraces and driveway, so your privacy is guaranteed. * Rural, secluded location – yet near a busy town, traditional villages, beaches and Granada * Plenty of restaurants and shops – not just one bar or shop in the village * 5-minute drive to shops – no long round trip for shopping * Air-conditioning to keep you cool – fans are not always enough in the summer * Good wifi covers the house and grounds including the pool – no waving your device around to get a signal * Gated pool in sight of the house – easy to keep an eye on children * A bestselling book written about the area – ‘Driving Over Lemons’ by Chris Stewart – a ‘must-read’ before your stay! WHY CHOOSE ALMOND HILL HOUSE? * Rural, secluded location – yet near a busy town, traditional villages, beaches and Granada * Plenty of restaurants and shops – not just one bar or shop in the village * 5-minute drive to shops – no long round trip for shopping * Air-conditioning to keep you cool – fans are not always enough in the summer * Good wifi covers the house and grounds including the pool – no waving your device around to get a signal * Gated pool in sight of the house – easy to keep an eye on children * A bestselling book written about the area – ‘Driving Over Lemons’ by Chris Stewart – a ‘must-read’ before your stay! toilet, shower, Large non-slip walk in shower. Heated towel rail. Wood-burning stove for winter rentals. Starter pack of wood included. Three routers ensure wifi reaches bedrooms, gardens and pool terrace. Three routers ensure wifi reaches all bedrooms, garden and the pool terrace. 90cm Smeg cooker. Five-ring gas hob with electric oven. The house is rented on a self-catering basis but we supply a few items for your first day or two including tea, coffee, sugar, herbs and spices, lavatory paper, dishwasher tabs and bin liners. electric kettle, hand-held food blender, good range of sharp knives, pans and utensils. Cutlery, plates, glasses for 14. Plastic plates and glasses for pool area. Well equipped with Smeg range cooker, 2 fridges, dishwasher and microwave. Small library with collection of novels, maps, guide-books and board games. GROVES AND ORCHARD Over 100 olive, citrus (oranges, tangerines, lemons, limes) and almond trees as well as pomegranate, figs, avocado and grape vines. Please help yourself to fruit when in season. The Wisteria bedroom has a private balcony with table and chairs overlooking the garden terrace. Kyaks and Canoes can be hired in La Herradura - a beautiful beach 50 minutes from the house. Professional bikes can be hired locally and delivered to the house. Skiing in the Sierra Nevada is 1 hour 15 minutes by car (late November to early May) Off-piste skiing available nearby with qualified guides - for experienced skiers only. The property has been registered as a 'Vivienda Rural' (approved by the Andalucia Tourist Board - VTAR/GR/0007) since 2002 – one of the first to be registered in Granada province. My girlfriends and I booked this lovely farmhouse for a short weekend stay at the end of February. Matt’s knowledge of the best tapas bars to visit in Granada made for a wonderful day of wandering the streets of Granada after our visit to the Alhambra. Their local restaurant recommendation was also a hit later on that evening. On our last day, again on the owners recommendation, we walked through the white villages - about half an hours drive away. These are really beautiful villages - so high up in the mountains and the lunch there was wonderful. We kept ourselves busy but any downtime was spent on the lovely veranda overlooking the pool (we had 22 degrees in February) drinking in the mountain view or at night sitting in the cosy sitting room with the roaring stove keeping us warm. 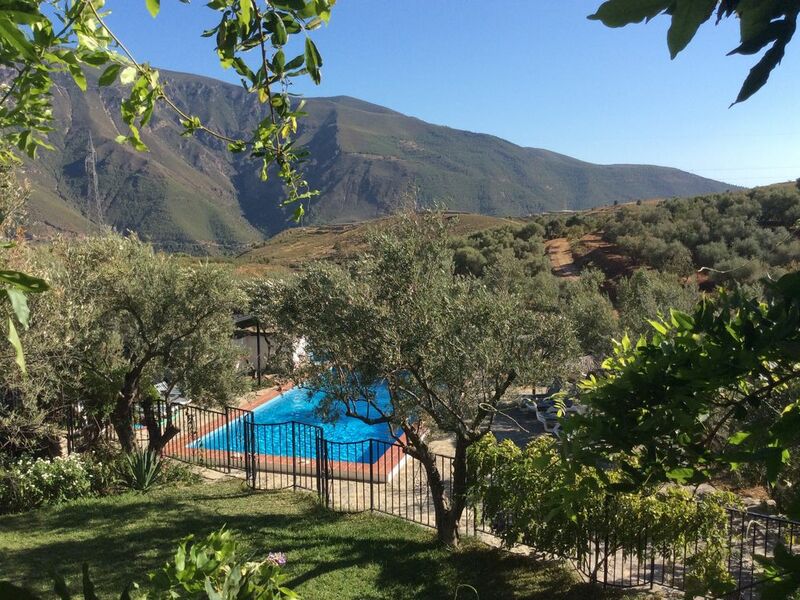 I would highly recommend this wonder authentic spanish farmhouse for any type of stay. I hope to return again one day with my family. There is so much to visit nearby and the peace and tranquility of the farmhouse would be always wonderful to return to. We stayed at Almond Hill house between 14 and 21 July 2018. Sarah and Matt were there to welcome us and show us around the house before leaving. They left a homemade bread and olive oil made with their olives. The house corresponded to the description. It is in a very calm and secluded place. The views from the garden, swimming pool and upper room terrace were beautiful. We had a very relaxing holiday enjoying the pool (its terrace is very sunny but has a lot of shade so you can stay near it without burning as a crisp). The pool is in the sun most of the day. The garden and its terraces and sitting areas are just beautiful. Matt and Sarah were always available when we had a question and when we ran out of butane gas they came immediately with a new bottle. Although they live in the house next to Almond Hill we did not see them. They cannot see the garden, its grounds or the swimming pool. A very private, relaxing and beautiful place. Well maintained home. Spacious and cosy. Comfortably catered to our 10 cyclists with ample kitchen, catering, bedroom, bathroom and laundry facilities. Pleasant stroll into town. Highly recommend Matt and Sarah as terrific hosts. Best view of the Sierra Nevada! Sarah and Matt are perfect hosts, helpful but never intrusive. The area is beautiful with many places to visit-Granada and the white villages etc. Good places to eat locally, and only 25 mins to the sea.The house is clean, spacious and well appointed, good kitchen and BBQ, lovely pool which the children and adults loved. I stayed at the house for the entire week...didn't need to go anywhere else, look out for the goats, amazing! Freshly picked lemons made the G&Ts absolutely perfect. Thank you, all 13 of us had an fabulous week.....ages 1 to 74. We will be back! We were a group of ten staying at Almond Hill House for a walking holiday. The house is as good as described, with ample space to accommodate us all comfortably and had all the facilities we were expecting. Sarah and Matt provided excellent customer service, replying promptly by email or text to queries both before and during the stay. There are superb walks that can be done directly from the house, including a section of the GR 142. The starting points for higher level walks in the Sierra Nevada can easily be reached by car, for example it took us 40 minutes to drive to the village of Capileira. Returning to he house in the afternoon, it was great to have a swim in the pool, then prepare some food and eat while sitting at the garden table in the warm evening. Another review has mentioned the lane access; we had no difficulty driving right up to the house in our hired Zafira and Touran, but I think larger vehicles than this would have made the drive challenging. We all enjoyed our stay at Almond Hill House and we would certainly recommend it to others. * ÓRGIVA is the heart of La Alpujarra. It's a bustling working town which has its own lively Thursday market. * Traditional Andalucia WHITE VILLAGES of Pampineira, Bubión and Capileira are a 20-minute drive. Enjoy Pampineira's artisan chocolate factory, the villages' higgledy-piggledy alleyways which date back to before the Moors. * GRANADA and THE ALHAMBRA (50-minute drive) is a great place to get lost in the old Arabic quarter and marvel at the architecture, stumble across small squares with local bars. * Enjoy a SEAFOOD LUNCH ON THE BEACH year-round at Salobreña or La Herradura – a 35-45 minute drive.